Earth has enough to satisfy everyone’s Need…. 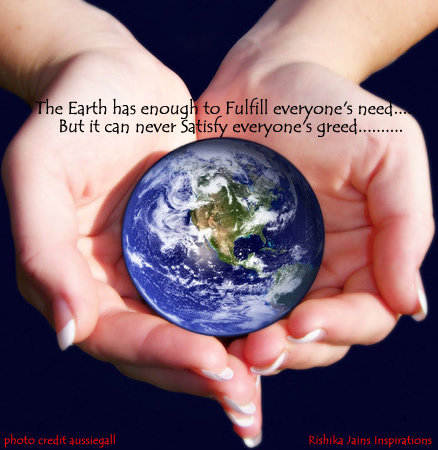 The Earth has enough to fulfill everyone’s need….. But it can never satisfy everyone’s greed….. Global Warming is a real and present danger. Each and Everyone of us has a responsibility towards Mother Earth. Let us pledge to save earth by becoming environment friendly. – Switching from plastic to a reusable cloth bag. – Turning off the faucet when brushing your teeth (you can save as much as 3 gallons every time!). – Bike, walk, take public transportation or carpool to work or school. – Jog outside to save energy that would be used on a treadmill. – Get a lunch box instead of brown-bagging or eating out of takeout containers. – Buy local fruits and veggies, or start your own garden. – Think outside of the bottle. Bottled water costs 1900 times more than tap water! World Environment Day is celebrated on June 05 every year. Take a small pledge and make a HUGE contribution towards a greener earth…..